We’re wrapping up work in progress week today! I will admit that I conceived 2 new quilt ideas this weekend… but they’re not technically in progress yet so I think I can wait a bit to share them here. Tomorrow I’m going to debut my hide-the-basting-stitches EPP tutorial! Stay tuned it’s going to be exciting. Today we’re taking a break from our regularly scheduled complete obsession with quilts to share a few non-quilt projects. 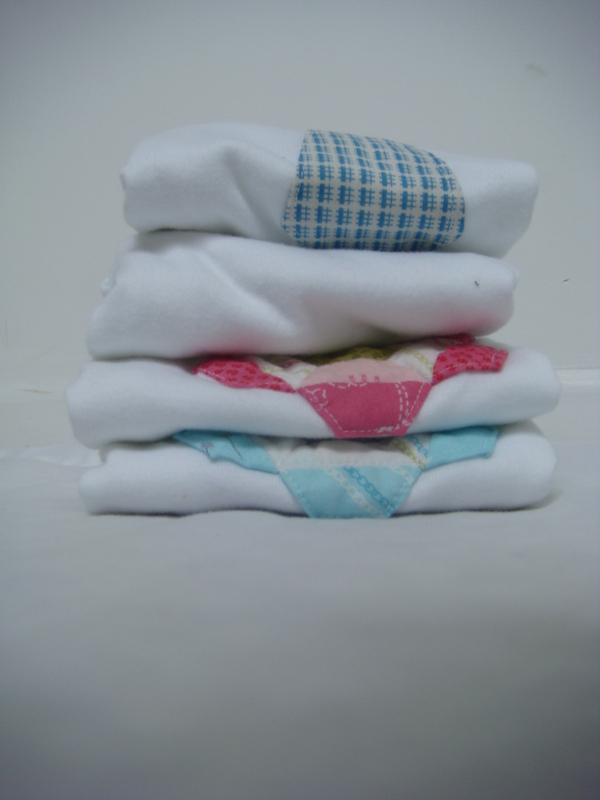 One great thing about quilting is that it teaches general sewing skills. I honestly could barely thread my machine before I made my 1st quilt. By the time I was done with my 2nd quilt, I was much more comfortable with sewing in general. 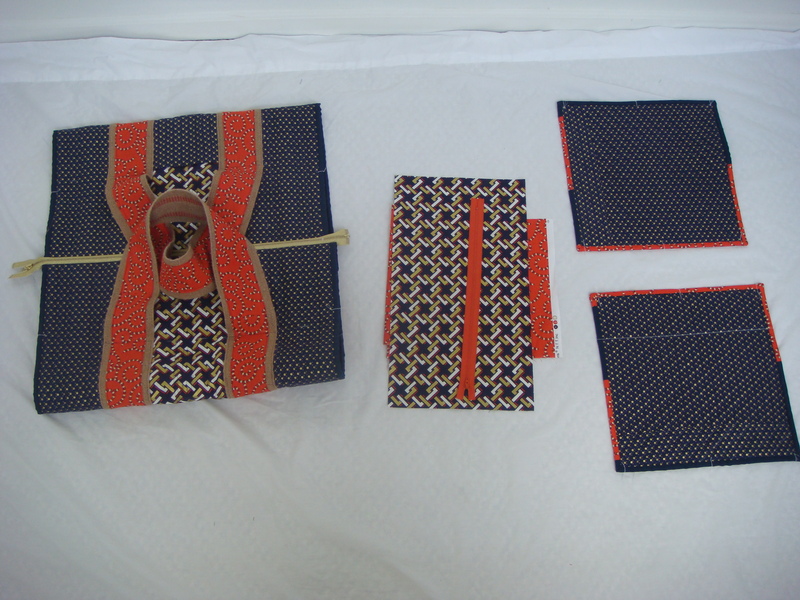 I also learned hand sewing from binding my quilts and that is another valuable tool. I have used those skills to make every curtain and decorative pillow in my house, not to mention 10 or 15 quilts (I really should count sometime). I think sewing is a really useful skill and I hope to get more people excited about it! Now of course I take every gift opportunity and turn it into a sewing opportunity! My church put on a casual baby shower for 2 friends of mine who recently had their 2nd and 4th babies. They asked for diapers and wipes but of course I’m a rebel so I sewed something cute instead. I decorated these little onesies using a combination of english paper piecing (EPP) and machine appliqué. 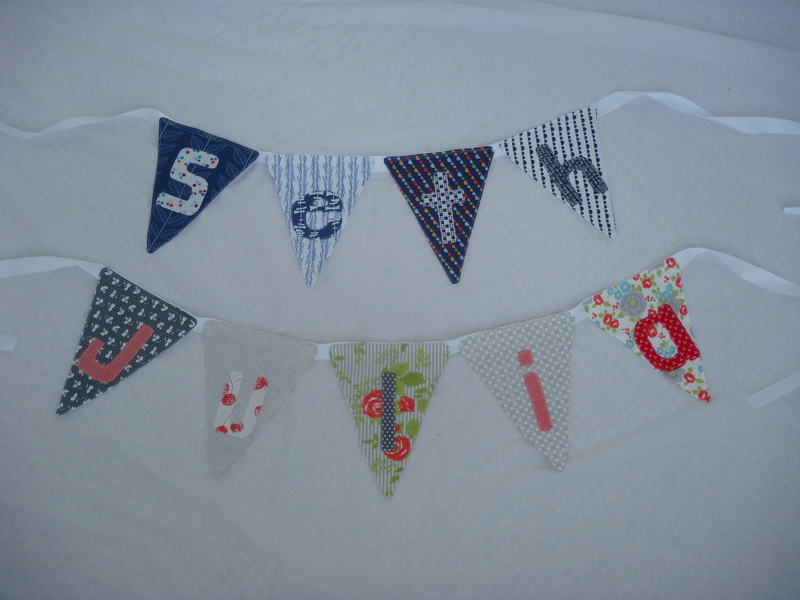 I also made these name buntings to hang behind the gift tables. I think these will be really fun hung in their nurseries or saved for future birthday parties. Linking with My Quilt Infatuation for Needle & Thread Thursday! This entry was posted in Uncategorized and tagged bags, gifts, WIP. Bookmark the permalink. You’ll never regret knowing how to sew. It is truly a useful skill as well as an enjoyable pastime. The bag is looking great. Don’t be intimidated by those zippers! Sarah!!!! Adore the bag. Love love love. You just keep posting things in my to-do list!!! How adorable! Those onesies are so sweet and the handstitching is just perfect. Love the bag too. Pretty awesome. Sarah, you have so many great projects! Love the onesies and bunting! and that bag is fabulous! !